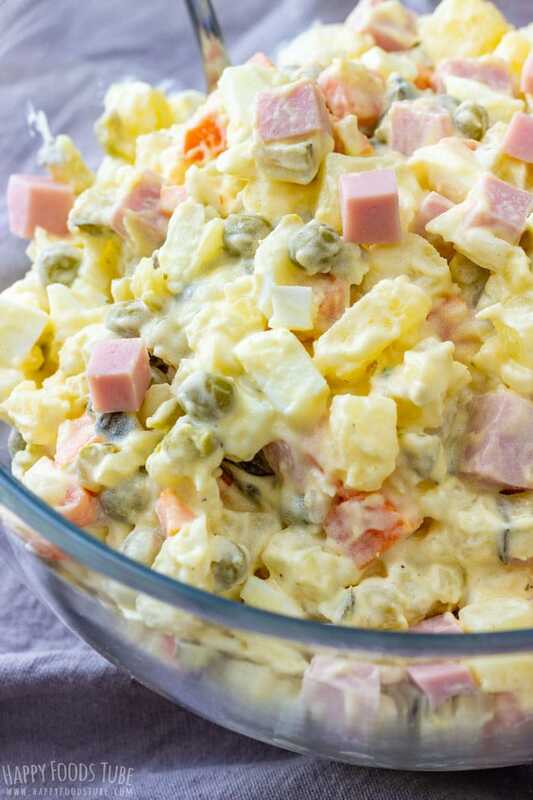 An easy recipe for creamy potato and ham salad. This make-ahead side dish is always a crowd’s favorite. Perfect for large gatherings and celebrations! 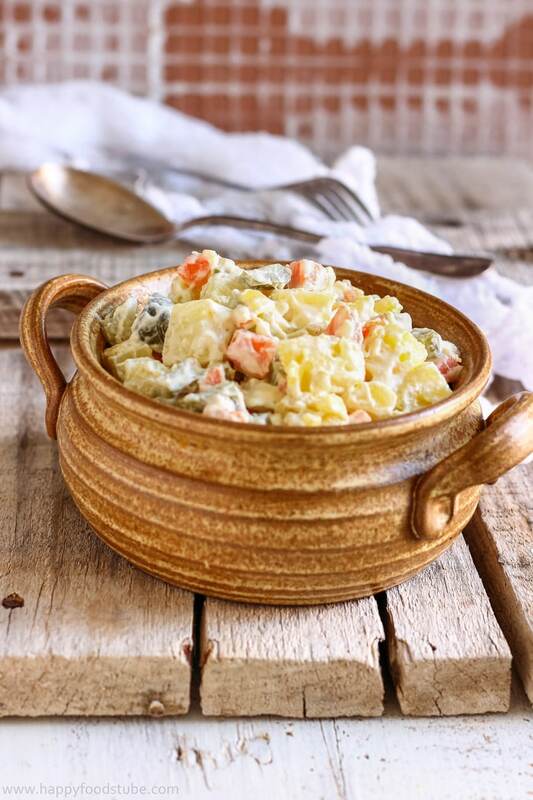 There are so many versions of potato salad out there, don’t you think so? This potato and ham salad is one of 3 potato salad recipes I have now on my blog. The other two are Spanish Chorizo Potato Salad and Dill Pickle Potato Salad. 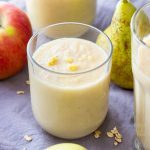 They all are easy to make and tasty so I hope you will find your favorite one among them! 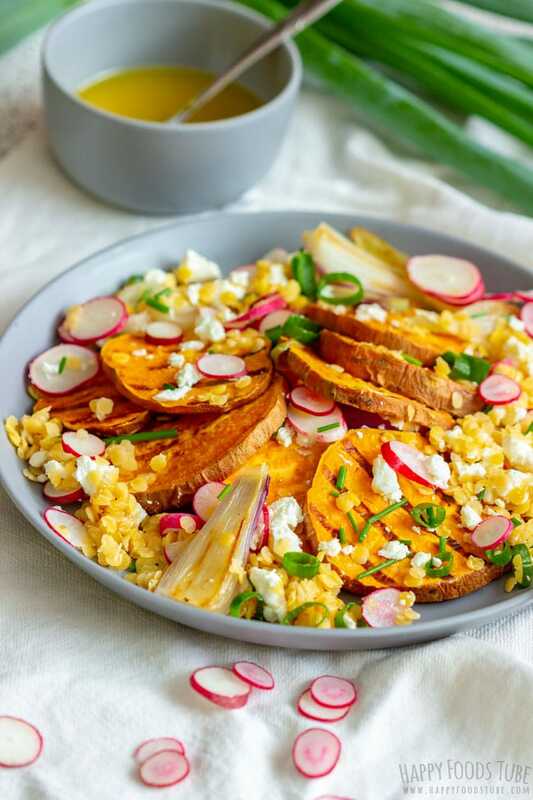 I also have Grilled Sweet Potato Salad which is perfect for summer barbecues. Cooking the eggs, carrots and potatoes. 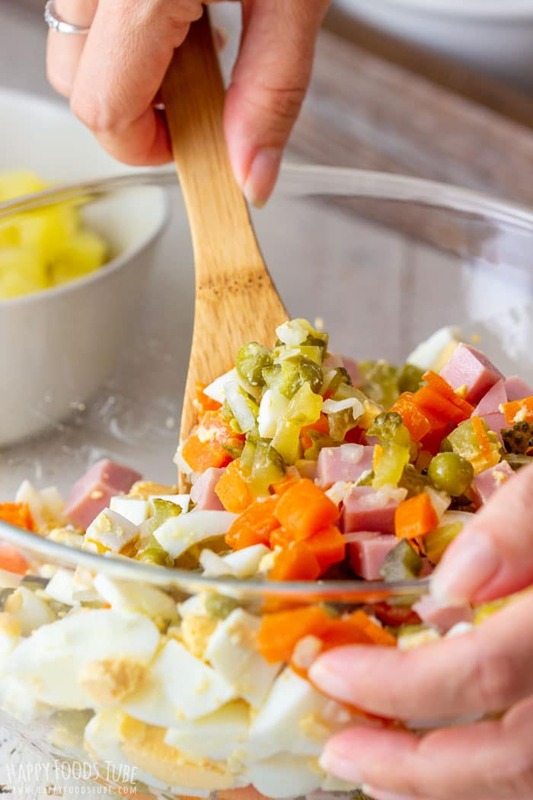 Cutting the veggies, hard boiled eggs and ham into bite-size pieces. When it comes to onion and dill pickles (gherkins) I highly recommend chopping them as finely as possible. Combining everything in a mixing bowl that is large enough to hold all the ingredients. The larger the bowl the better. It will make your mixing easier. This is basically a part of stage 3. You stir in mayonnaise that you have mixed with sour cream. Season with salt and black pepper. Now all you have to do is cover the bowl with a plastic wrap and chill it well in the fridge before serving. 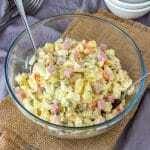 What potatoes are best for making potato salad? Waxy potatoes are an excellent choice because they hold their shape well after cooking. The most common varieties are: Red, new or fingerling potatoes. 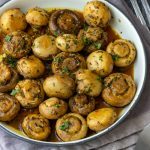 If you would like to read more about potato varieties, I recommend this post: Types of potatoes. Different types of potatoes might take different times to cook so keep an eye on them. You don’t want to over cook them. Also the larger the potato the longer the cooking time! I used new potatoes that needed 20 minutes. If you don’t have medium eggs, don’t worry. The size does not really matter here. 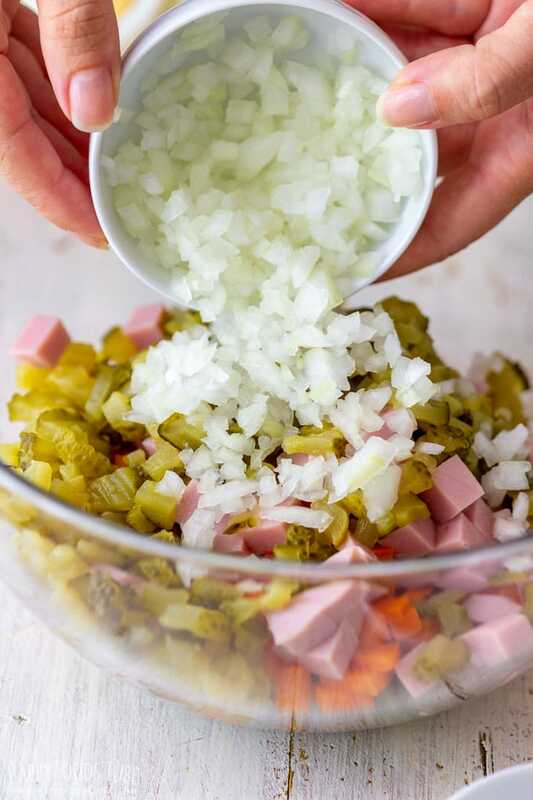 Onion and gherkins/dill pickles are both important ingredients. 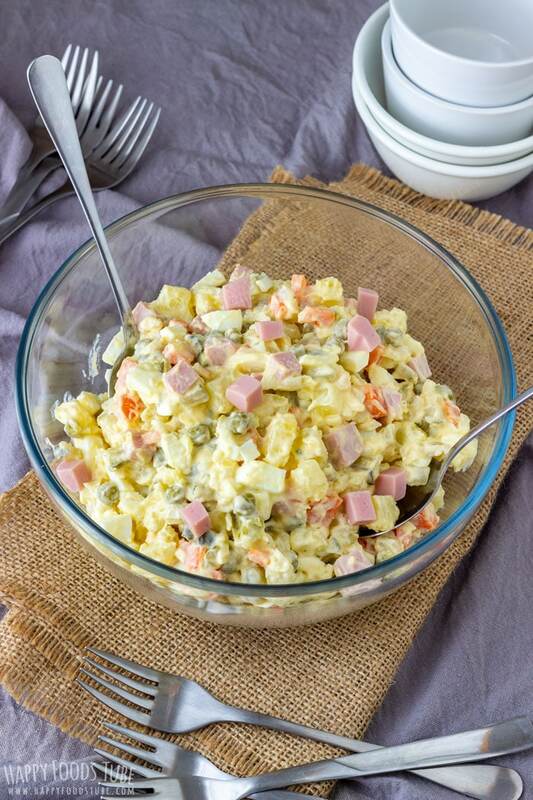 They add some crunchiness and flavor to this potato and ham salad. I don’t recommend leaving them out. If you are not an onion fan, just chop it as finely as possible. That way, if you stir it around with the rest of the ingredients, the onion blends into the salad and you will hardly taste it. 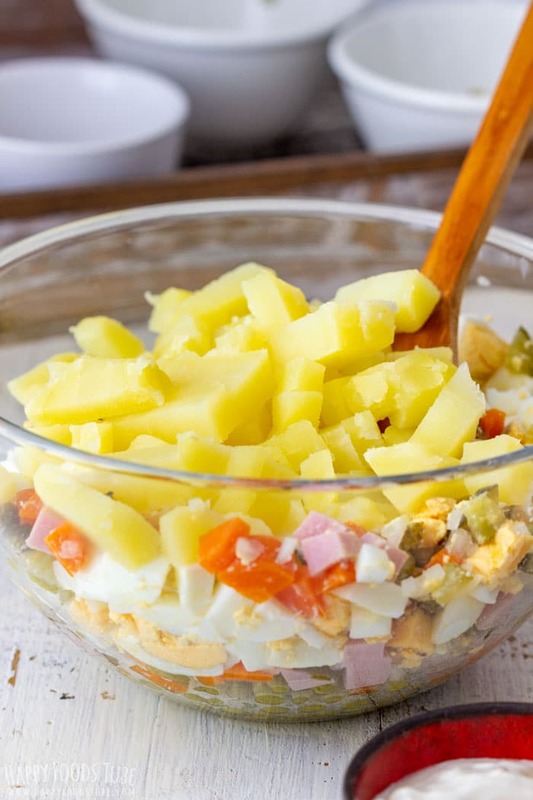 This potato and ham salad needs to be chilled in the fridge before serving. Now the longer you chill it the tastier the salad. For that reason keeping it in the fridge overnight is the best option. Also bear in mind that by sitting in the fridge the flavors will develop and the salad turns saltier than before. That is why I suggest adding a little bit less salt than you would normally and check right before serving if more is needed. Waxy potatoes – If you don’t have these on hand, you can use other types. However, your salad will more likely look mushier. If you don’t mind this then go ahead and use what you have on hand. Canned peas can be completely omitted if you don’t have it on hand or don’t like it. 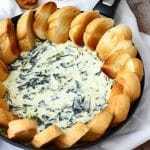 Sour cream – Use crème fraiche or Greek yogurt instead. 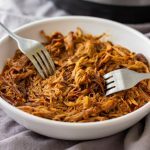 Ham – I used a turkey ham but you can use any ham you like. Wash the potatoes, carrots and eggs. Peel the potatoes and carrots and place them in a pot. Add the eggs and pour in water (just enough to cover all the ingredients). Add 2 teaspoons of salt and cover with a lid. Bring the water to a boil, reduce the heat to low and simmer (lid on) for 10 minutes. Take out the eggs and place them into a bowl. Pour cold water over and set them aside. Let the potatoes and carrots cook (covered) until they are done, but don’t over-cook the potatoes. When done, drain the water and let the veggies cool down completely before chopping them into tiny cubes/pieces. Finely chop the onion, drain the peas. Drain and slice the dill pickles (gherkins) into small pieces. Dice the ham. Peel the eggs and cut them into small pieces as well. Transfer everything into a large bowl, altogether with diced carrots. Give everything a good mix. At last add the potatoes, little salt and a generous amount of black pepper. Combine the mayonnaise with sour cream and stir this into the salad until well combined. Give it a taste. Add more seasoning if needed. 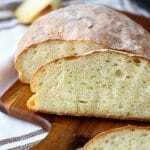 Refrigerate for several hours before serving (for best results overnight)! Waxy potatoes are the best option for making potato salad. They hold their shape better after cooking. Common varieties are new, red or fingerling potatoes. 2 diced cooked carrots fill 1 cup. 5 ounces of drained canned peas = little less than 1 cup. 5 ounces of gherkins= 1 cup. 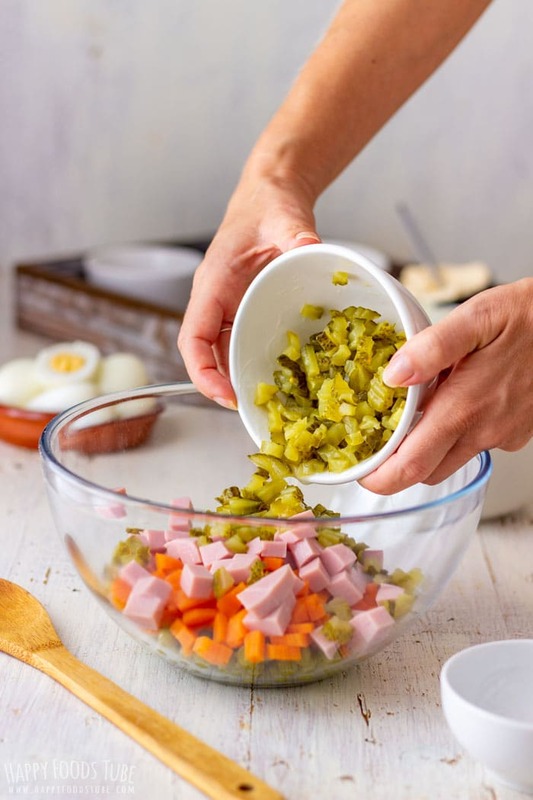 5 ounces of diced ham = 1 cup. The amounts of the ingredients can be easily adjusted to your liking. Onion and dill pickles should not be omitted. They give the salad a little crunch and extra flavor. I recommend finely chopping the onion. That way it will blend with the salad easily and you won’t find it overpowering. The overall cooking time does not include time needed for the veggies to cool down after cooking. Thank you very much, Amanda and thanks for stopping by! Now this sounds hearty! Perfect for fall. Thanks for sharing. 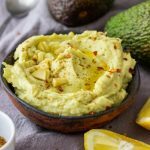 What a great alternative to the basic potato salad. Love the color the carrots and peas give this salad. 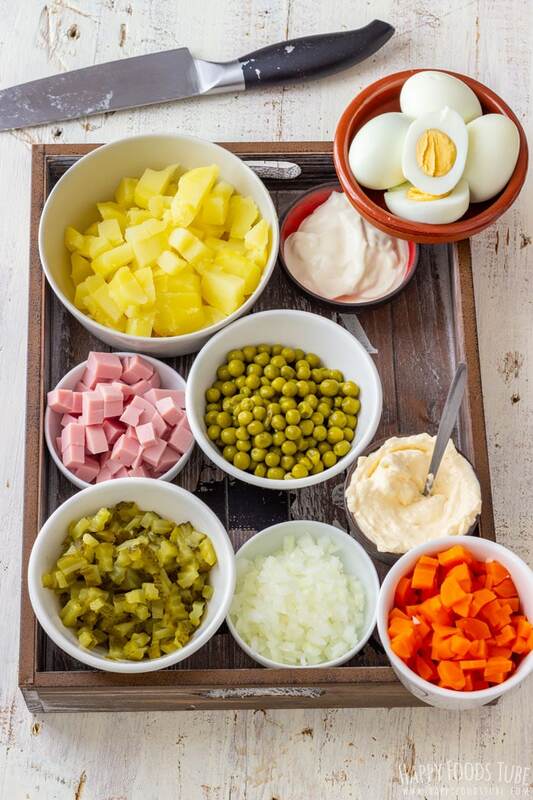 I love your use of ham – this would be a perfect holiday side as well as a holiday leftovers side! YUM! 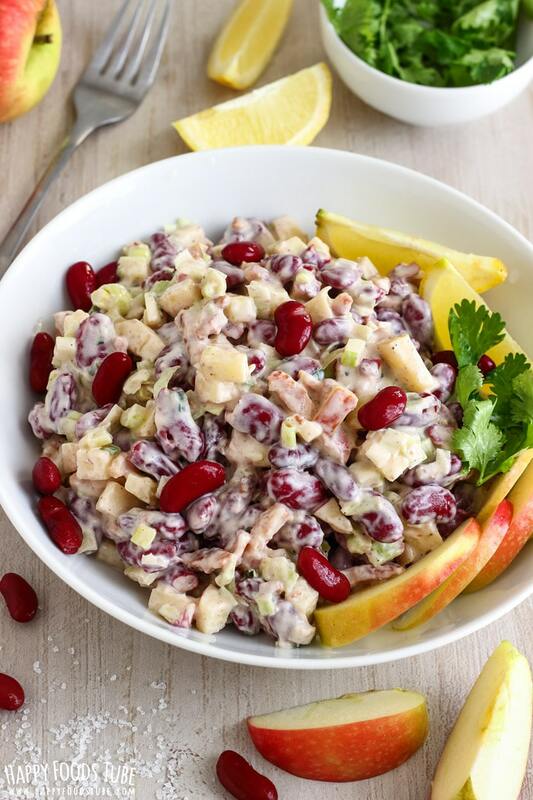 I love potato salad and yours looks so perfect! What a beautiful looking salad!! 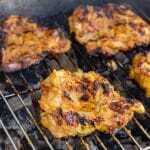 Looks so flavorful .. adding the ingredients to my grocery list.. can’t wait to try it!